Yoder Oil Company sells Diesel Exhaust Fluid in Gallons, 2.5 gallons, drum, totes and bulk. DEF or Diesel Exhaust Fluid is a nontoxic operating fluid necessary for the operation of SCR systems to reduce NOx. Diesel Exhaust Fluid is a solution of 67.5% purified water and 32.5% ultra-pure automotive grade urea. The 32.5% urea concentration is the ideal solution as it provides the lowest freeze point. 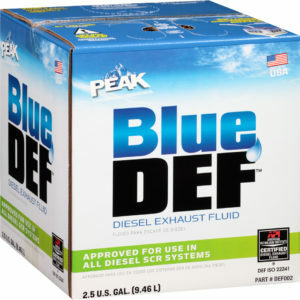 We carry the Peak Blue DEF line of products, which is the Americas #1 brand of diesel exhaust fluid. Yoder Oil has free delivery in the area surrounding our Elkhart and Indianapolis locations and we will ship anywhere in the United States. We also carry a line of Peak equipment that works with diesel exhaust fluid to ensure the product is not contaminated in any way. Diesel Exhaust Fluid is not hazardous, toxic or flammable. You can call or email our customer service department for information on the full line of products we carry.